When I was in college working towards my meteorology degree, I learned about a group of students that got together once in a while to hang out and talk about weather. This was known as the local student chapter of a group called the American Meteorological Society (AMS). Back then it was a chance for me to get together with like minded people to talk about anything weather related. I did not realize then that this society would shape the start of my career. There are numerous job sectors out there that have a professional society attached to them, from the American Bar Association to the National Association of Realators. They all relatively serve the same purpose: membership with perks. Amenities vary by society, but usually include items such as networking with others in the same field, professional development, early access to internship and job postings, and attendance to annual conferences. 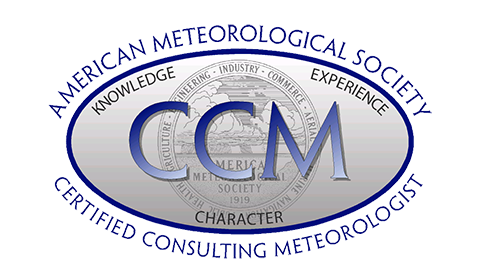 When I first learned about AMS, I was surprised there was a society dedicated to the meteorology field. I was also surprised to find out it has been in existence since 1919! Today, as they celebrate their 100th anniversary, they have over 13,000 members in the weather, water and climate enterprise. The society does a lot for its members at all career levels. They include journal publication, certifications, professional development, and of course their annual meeting. Looking back at my career so far, the Annual Meeting has provided some wonderful opportunities for me, and I would like to share some experiences with you. Back in college, I was given the opportunity to present some of my work at a meeting in New Orleans. It was very overwhelming, as there are thousands of people there, and numerous talks and sessions to attend. While the scientific talks were very informative, I begun to realize this was an excellent opportunity to meet other students and professors, including those that could help me along my career path. I was also able to talk to numerous graduate school departments, as I was looking to advance my college career after receiving my bachelors degree. I learned quickly it was important to get out of my comfort zone and speak to these people in person. Sending an email can only do so much. Putting a face to the name was so important. Two years later, I was able to go back to a meeting to present some of my graduate thesis. One of my main goals was to get a job, so I talked to a whole lot of companies who could be potential employers. During my poster session, I talked to a few people about the project, not really knowing who they were. Later, I found out one of the people I spoke to was on the hiring committee for the job I currently have. This goes to show any conversation at a professional conference can lead to a potential opportunity. After getting a job, my involvement in AMS did not stop. Upon returning to the annual meeting, I attended the first ever conference for early career professionals. I learned a lot about what the society does for members at all levels of their career, and how one can give back to the society. This motivated me to join the Board for Early Career Professionals the next year. This has given me the opportunity to work with some amazing people in the weather, water and climate enterprise. I have also worked with some big names in AMS, including the executive director, and past presidents. I have since attended every single early career professionals conference, and at the time of writing, I am serving as chair of the Board for Early Career Professionals. I am very grateful for what the society has done for me, and I am willing to give back in any way I can. This week, the annual meeting is taking place in Phoenix, Arizona. I will be there, looking to network with as many people as I can.